James Lawson: An Advocate of Peaceful Change For more than 50 years, the Rev. James Lawson has taught and practiced the principles of non-violent resistance. The Vanderbilt University professor talks with Steve Inskeep about how those principles apply in a time of war. For more than 50 years, the Rev. 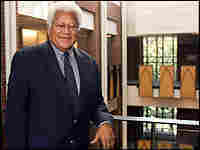 James Lawson has taught and practiced the principles of non-violent resistance. The Vanderbilt University professor talks with Steve Inskeep about how those principles apply in a time of war.